In February 1998, Dr. Susan E. Swedo and her team at NIMH published the first description of Pediatric Autoimmune Neuropsychiatric Disorders Associated with Streptococcal Infections (“PANDAS”) in Am J Psychiatry and provided guidelines for diagnosis. In a published article in 2004, Dr. Swedo updated and clarified the guidelines. Now, the Guidelines and Therapeutics Committee of the PPN, of which Dr. Swedo is a member, is providing a guideline for diagnosing PANDAS based upon those two published papers. These succinct guidelines seek to clarify the intentions of the Swedo NIH team, as well as those areas of the text that inadvertently resulted in inconsistent application of the criteria by different researchers. The obsessions, compulsions and/or tics must be severe enough to meet criteria for OCD or a tic disorder and interfere with the patient’s ability to function at pre-illness levels. Symptoms of the disorder first become evident between 3 years of age and puberty. The early onset is related to times of peak exposure (early grade school years) and the development of cross-species immunity against GAS infections (due to production of antibodies against the conserved portion of the GAS M-protein). These antibodies are demonstrated in 98% of 12-year-old youth. However, the remaining 2% would remain vulnerable to post-GAS sequelae, including PANDAS and rheumatic fever – as was demonstrated in military recruits who developed rheumatic heart disease at the age of 18-22 years. Postpubertal onset of PANDAS is possible and seen by NIMH and clinicians in the field. 3a. Clinical course is characterized by the abrupt, dramatic onset of OCD or tic symptoms. Often, the onset of a specific symptom can be assigned to a particular day or week. 3b. Clinical course is characterized by a relapsing-remitting pattern with abrupt, dramatic, debilitating exacerbations of existing symptoms, at which time the symptoms seem to “explode” in severity. While tics are known to worsen when the patient suffers from an infection, for this criteria to be met the tic exacerbation has to incapacitate the patient – often suddenly precluding attending school or requiring a visit to the emergency room. Either in 3a or 3b, the symptom severity usually decreases significantly between episodes, but sometimes does not remit to pre-onset levels. Further, since children are consistently exposed to pathogens at school or with siblings and post-onset immune responses to viral and bacterial infections (not just GAS) can trigger exacerbations, the symptomatic periods may be protracted, but will vary from patient to patient. Symptom exacerbations must be temporally related to GAS infections; i.e., associated with a positive throat culture and/or elevated anti-GAS titers (ASO or anti-DNase B). In PANDAS, GAS infections often are found without apparent pharyngitis (i.e., the child did not complain of a sore throat). 24-48 hour agar culture is recommended for checking for colonization. Checking for perianal group-A strep is also recommended, as rectal infections have minimal symptomatology and will be missed without direct examination and culture. Some clinicians are concerned that a positive throat culture in the absence of acute pharyngitis may indicate a “carrier” state. Carriage is defined as colonization without immunologic response. The evidence in PANDAS, as in Sydenham chorea, is that the neuropsychiatric symptoms are associated with an immunologic response and resolve with removal of antibodies. As such, onset of acute neuropsychiatric symptoms would indicate an immunologic response and, by definition, not be carriage. 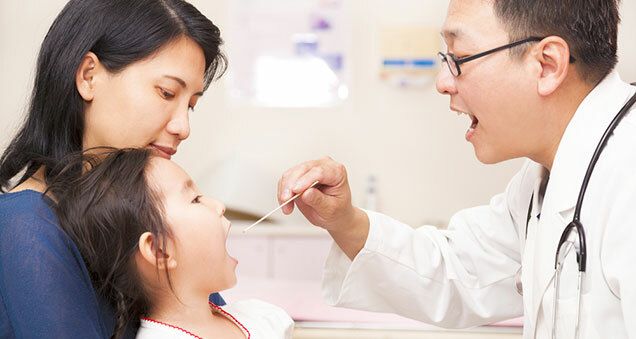 If a child is seen within a few days of symptom onset and has a negative throat culture, it may be useful to check baseline anti-streptococcal antibody titers and then obtain a second set of titers 6 – 8 weeks later and look for a 2- to 4–fold rise, which is suggestive or indicative of a recent infection. For criteria 3b and 4 to be met, the initial exacerbation and preferably one other exacerbation need to be temporally associated with GAS. However, research has shown that after the initial infection, exacerbations are associated with other non-strep triggers. During symptom exacerbations, patients will have abnormal results on neurological examination. Motoric hyperactivity and adventitious movements such as choreiform movements or tics are particularly common. Choreiform movements are small, jerky movements occurring irregularly and arrhythmically in distal muscles. They are most easily observed by having the child stand with eyes closed and arms outstretched in front of him and fingers slightly separated (Romberg stance). After a few seconds, fine piano-playing movements will be seen in the fingers, and there may be mild pronator drift of the hands. These movements are normal “overflow” in children younger than 5 years of age, but should be absent in children older than 6 years. Also of note, if a child has adventitious movements of his trunk (writhing or instability), shoulders or upper arms, this would raise concerns that he might have chorea, and a diagnostic work-up for Sydenham chorea should be done. It is particularly important to make the distinction between PANDAS and Sydenham chorea, since the latter is a known manifestation of rheumatic fever and has its own distinct characteristics and treatment regimen. The diagnostic criteria for PANDAS require only the presence of OCD or tics, but comorbid neuropsychiatric symptoms are universally present – similar to the diagnostic criteria for PANS. These comorbid symptoms were highlighted in the original PANDAS description (AJP 1998). The symptoms appeared concomitantly with the OCD/tics and were of similarly abrupt onset/exacerbation as the primary symptoms of PANDAS. Subsequent research has reinforced the observation that the presence of significant comorbidity, particularly the somatic symptoms such as urinary frequency, mydriasis and insomnia, helps differentiate PANDAS from other conditions, such as Tourette syndrome or non-PANDAS OCD. The comorbid symptoms are defined and described in the preceding section on diagnosis of PANS. The comorbid symptoms always begin as suddenly as the OCD/tics, but often remit on their own timeline, such that a child may have lingering symptoms of inattention, impulsivity and emotional lability for days, weeks or even months after the OCD/tics have disappeared. In other cases, the child experiences persistent anxiety and obsessive-compulsive symptoms, while other comorbid symptoms have waned in severity. Multiple comorbidities occur in nearly all PANDAS/PANS patients, but the types of comorbid symptoms vary across patients and even across time in the same patient, as it is not uncommon for the type of comorbid symptoms to change multiple times during the course of the illness.